As some of you clever people guessed, my latest work in progress is a new pattern in my Color Mentor series! Are you color-curious? This scrappy string quilt is poised to broaden your horizons. Have you ever created a rainbow blend with scraps? It's an ideal experience to enrich your color instincts. With Iridescent, a Level 2 Color Mentor pattern, you'll learn to differentiate warm vs. cool iterations of colors and build harmonious relationships between them. Sewing with scraps deepens the challenge and the potential for growth. 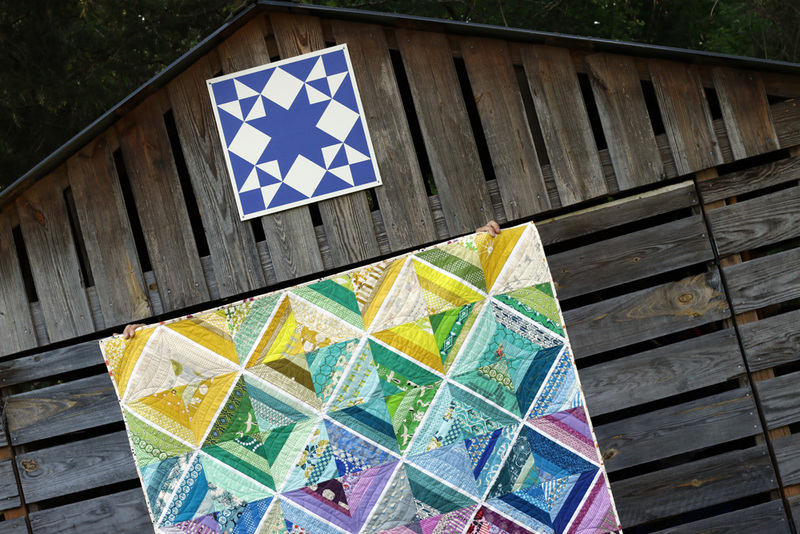 The Iridescent Quilt pattern includes a color key to help you sort your scraps, as well as a detailed color map. For a straight-forward project, use the color map to create a quilt with the same balance and placement of hues as mine. To up the challenge, you can also work improvisationally. Make as many of each type of block as your scraps allow. Then follow the pattern guidelines to lay out the blocks. What a great color work out! Iridescent is a scrap-friendly quilt, incorporating strips of a wide variety of length and width. The pattern demonstrates the quilt-as-you-go method, though traditional paper foundations are also an option. Finished size: 56" x 64” throw quilt. Though, it'd be easy peasy to make her bigger. Just add more blocks! I chose to finish my version with custom block quilting. The multi curve pattern highlights each of the on point rainbow squares. She's backed in Essex linen/cotton blend and a new Cotton & Steel linen print. For durability, I pieced the linen with a short stitch length and 1/2" seam allowances. The linen on the quilt back makes this quilt a bit heavier and cozier than usual. Bound in a floral Art Gallery fusion print. It seems to magically match whatever part of the rainbow it hits! I got lucky with that one. My Iridescent quilt is listed now in my handmade shop. I hope someone needs a dose of scrappy-happy rainbow for there home. Thanks, friends!